Trends are there to be obeyed and so we finally cut back on carbs after dark... but there are the occasional daylight meals. 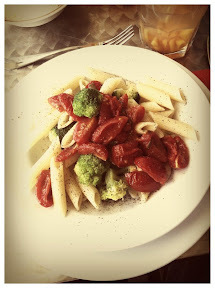 Penne with broccoli topped with cherry tomatoes slow fried in sage and butter from milk of Piedmontese cattle. Deliriously loved up engineer who likes to indulge in fine food and wine. Lions, Tigers, and Science... oh my! How do you see yourself in five years ? I'd like to keep this untitled. hi bitche!!!! can you be my bitche mate? This page, as well as many other things in life, may offend you. Note that no electrons were harmed in the creation of this page. It is made from 100% recycled bits. Do not use while operating a motor vehicle or heavy equipment. Hand wash only, tumble dry on low heat, do not iron.